Brr it is cold out there… okay now it’s hot! I mean cold… so this winter has been unpredictable here in Ontario. The question of should I wear a jacket to work seems to change day to day. While I am loving not shoveling a whole bunch of snow, it has had some challenges for calves. Changes in weather can be hard on calves but if we keep in mind their comfort we can keep them healthy and growing. One of the first things to keep in mind is something called the thermoneutral zone which is the range of temperatures that calves are able to stay comfortable without spending energy. In human terms it is the temperature range where you are not sweating or shivering! Calves are small and lack the body fat and giant energy producing rumen that adult cows have, so they are more comfortable at higher temperatures. A newborn calf that is healthy and dry does not spend energy between 10C (50 F) and 25C (78F), while a one-month old calf does not spend energy between 0 C (32F) and 25C (78F). 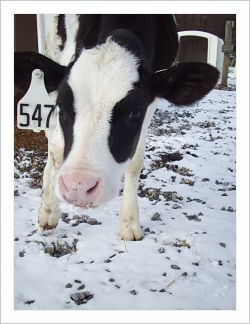 If a calf is sick or wet, they are more sensitive to low temperatures and will become cold at much higher temperatures. Think of huddling under the covers the last time you were sick, or think fondly of getting out of the pool on a warm summer day and wrapping yourself in a towel to stay warm. The same principle applies to calves. A warm and dry calf is a calf that will stay healthy. Does this mean on cold days calves are doomed? Nope, we just have to make sure we give them the tools to keep warm! First step? Keep them dry. This could be by using heat lamps for newborn, the dam can lick the calf dry, there are commercial calf warmers, heat lamps, and deep bedding with straw. Straw works well because calves can nest into it and it keeps heat in. Well products like shavings are great for keeping calves dry, since they cannot nest into it. This means that they will have to spend more energy keeping warm as calves can’t cover up and will have more of their body exposed to the cold. Straw is basically the calf equivalent of a good winter jacket. Since straw is expensive and can be hard to maintain I recommend a combination of shavings, straw and a jacket in the winter. A good shavings base to absorb liquid, straw on top for calves to nestle into with the goal of having the back legs at least partly covered when they lay down, and a calf jacket to keep them warm. Then maintain! Make sure the lying area stays dry. Calves lay down for around 20 hours a day! So there bedding needs to be dry and warm. This winter, and most springs, hutches are really hard to manage and lots of bedding will be needed as the wet conditions will mean that the inside of hutches are really likely to be wet and muddy- which will mean sick calves! And remember, sick calves are more sensitive to cold temperatures and more likely to be chilled. The next big challenge – keep them well fed. If calves do not get enough food they can run out of energy and will have trouble staying warm and keeping their immune system up and running. Rule of thumb? Feed Holstein calves 4L of good quality colostrum (stay tuned for more on what good quality is!) within 4 hours to get calves off to a good start. Then feed calves at 20% of body weight (over 8 liters of milk per day). Keep in mind that for a calf to maintain health and growth they will typically need to be eating at least 1 kg of calf starter a day and calves will NOT be able to do this for at least the first month of age. If you keep calves warm, dry, and well-fed, you are well on your way to raising healthy and happy calves – which will make you, and your pocket book healthy and happy!